Mohammed Jamal-Eddine watched TV news after dinner with his family at their home in Burlington. BURLINGTON — Three decades ago, Mohammed Jamal-Eddine returned home to Morocco from Boston to make a life-changing decision. Should he continue studying computer technology in Massachusetts, or switch to a school in Paris? France was closer to home, and to his beloved parents. But a Moroccan friend who was living there warned him: The French could spot a foreigner a mile away. Boston was different. Jamal-Eddine recalled the liberating anonymity he felt striding through the Back Bay alongside students from all over the world. Nobody gave him a second glance. “I wanted to live without being judged daily,” said Jamal-Eddine, a warm-eyed man with a neatly trimmed beard. Now, as he awaits the swearing-in of President-elect Donald Trump, who as a candidate made Muslims like Jamal-Eddine a target, the 48-year-old father of three wonders what is happening to the nation he chose to make his own so many years ago — and the country his children will inherit. 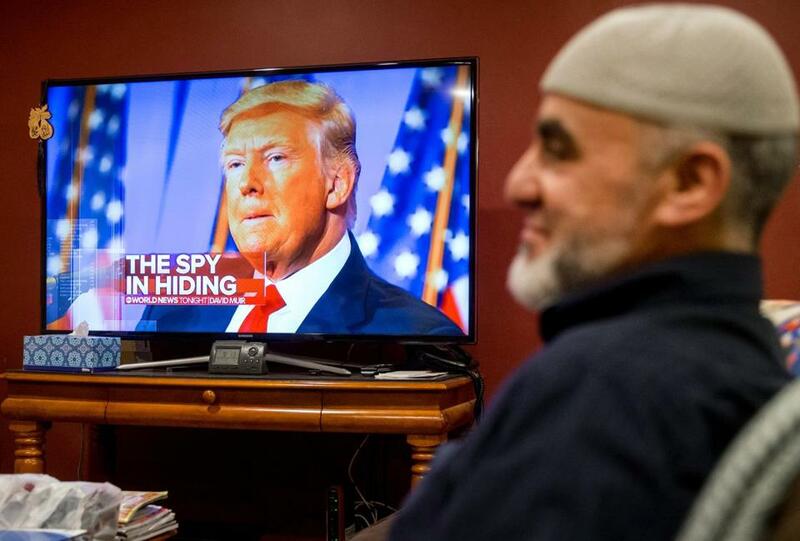 It is a question on the minds of many of the nation’s 3.3 million Muslims, whose patriotism and allegiances became a focus of the presidential campaign. 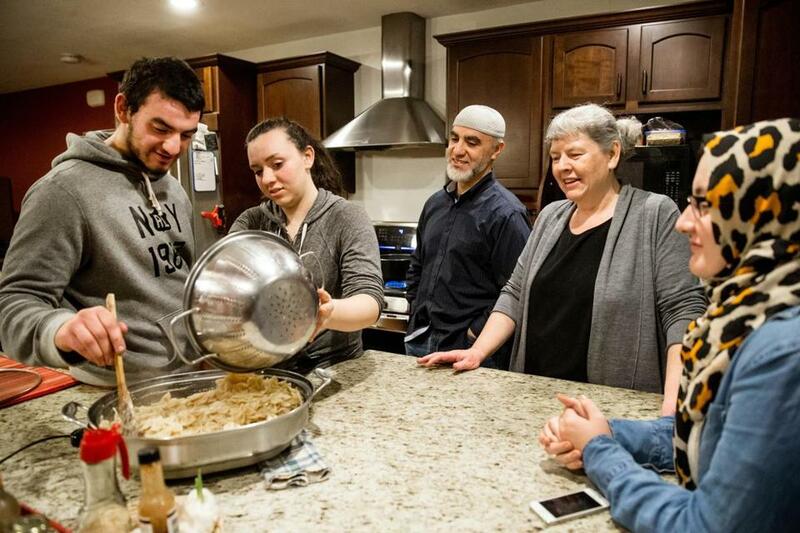 From left to right, Ameen Jamal-Eddine, Samira Jamal-Eddine, Mohammed Jamal-Eddine, Patricia O'Brien, and Sarah Jamal-Eddine prepared dinner together as a family at their home in Burlington. The inaugural events are sure to be of interest for Americans of all political stripes. Many share some of the financial woes that beset Trump’s working-class supporters — Jamal-Eddine is between jobs, and his kids will all be in college next year. But they cannot fathom how so many of their fellow Americans chose Trump as their president. Now, Jamal-Eddine and his wife, Patricia O’Brien, a convert to Islam, are watching and waiting to see what Trump will do. They keep the big screen television on when they’re at home, tuned to the news. Who is the latest cabinet pick? What was the latest tweet? O’Brien, who grew up in an Irish Catholic family in Woburn, may have never experienced life as a religious minority had she not taken a vacation with her sister to Martha’s Vineyard in 1994. She met Jamal-Eddine, who was going on a trip with friends, on a ferry to the island. Their families supported the marriage, which was celebrated in a Catholic church, with Jamal-Eddine’s brother reading from the Koran before the Mass. Twice in recent years, the mosque in Burlington was vandalized. But mostly, the Jamal-Eddine kids have lived ordinary middle class lives, realizing their father’s long-ago vision of becoming part of the American crazy quilt. Ameen, an Eagle Scout, takes six classes a semester at Middlesex Community College. At the battery supply center where he works to help pay for school, his co-workers hardly look up when he moves to the side for a few minutes for one of his five daily prayers. When Ameen comes home from work, he often finds half the driveway filled with donations for Syrian refugees, which he helps store and then load into a truck for shipment overseas by NuDay Syria, an aid group on whose board O’Brien serves. Many of the items come from neighbors on their street, who include immigrants from Cape Verde, South Korea, India, and Russia, and their second-generation relatives. Samira, a senior at Shawsheen Valley Technical High School, serves as president of the honor society, volunteers at the local hospital, and works at Target nights and weekends to save for tuition at Worcester Polytechnical Institute next year. Maybe, she thinks, over the next four years, the country will work through the homophobia, racism, and sexism that came to the surface during the presidential campaign. And, maybe, emerge with a resolve to change. “I’m not hopeful for this four years, but for the outcome these four years will bring,” she said. Sarah, a biology student at the University of Massachusetts Boston, is not afraid to wear her hijab in public, not even after hate crimes against Muslims spiked in the month following the election. She says she feels protected by God with her head scarf on, and insulated by the Boston area’s liberal politics and the Muslim-friendly places she spends most of her time — school, the mosque, her job at a travel agency. At the Islamic Society of Boston Cultural Center in Roxbury, she helps lead a program for younger teens that gathered to talk right after Election Day. Their religion, rather than isolating them, has propelled them into the community to give back, said O’Brien, a member of Burlington’s Town Meeting. In the next four years, she says, that spirit is more important than ever. To underscore her resolve, she plans to drive Friday to Washington so she can participate in the Women’s March on Saturday. Jamal-Eddine trusts in God — and, he said with hope in his voice, in his adopted country. When he returned to the United States in 1987, he worked at a cafeteria in Kenmore Square to help with school expenses. Occasionally, a customer dropped a racist epithet, he said, or stared at him as though he were stupid as his brain hustled to translate English to Arabic and back again. He can’t see it becoming as hostile to foreigners as the France that repelled him as a young man.